It’s one of the oldest marketing gimmicks in history. If you want a kid to buy something, you cram a cheap plastic toy inside and just wait while units fly off the shelves. Despite the fact this has been happening basically forever, organizations like the Center For Science in the Public Interest, AKA the Food Police, are just now starting to get involved. McDonald’s, long vilified as being spectacularly unhealthy and a major marketer to kids thanks to spokesclown Ronald McDonald, is getting the brunt of this attack (despite being supplanted in the unhealthy food department by Friendly’s and KFC). The firm has a choice: remove the toy from the Happy Meal or head to court. This comes after Santa Clara attempted to ban the Happy Meal along the same grounds. While the kids menu is here to stay, this just might bring about the end of the familiar Happy Meal as we know it. 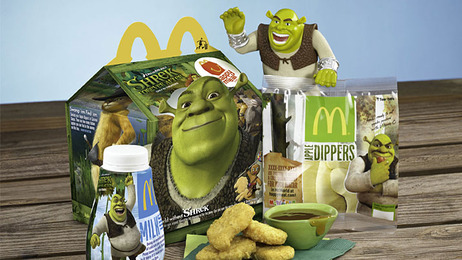 Or at least it’ll push McDonalds further down the healthy food road started with Apple Dippers and milk, rather than soda, with the Happy Meal. I can’t wait for my kids to choose between the tofu nuggets or the beanburger with their bland, hippie-approved Happy Meal.